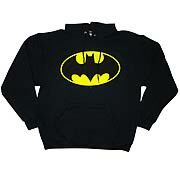 The classic Batman Hoodie will look good and withstand the cold in the Fall and Winter. Of course, once the weather warms, you will still look good if you wear it. You'll just have to put down the hood. Batman Classic Logo Hoodie: Strike fear into the hearts of the criminals of Gotham City (or your hometown) with this 100% cotton, high-quality black hooded sweatshirt. It's the next best thing to having a batsuit of your own - order yours today! Batman Joker Serious Dark Knight Hoodie: This special hoodie is an officially licensed Batman Hooded Sweatshirt pullover. These Batman Hoodies have been screen printed with classic artwork featuring a Batman image. They are made from heavyweight 9oz. cotton hooded sweatshirt blanks for warmth, comfort and quality.